Green or Other Third Party? Work Within the Green or Other Third Party? I know less about the Green Party than the Libertarian Party. The socialism promoted by their national platform and presidential candidates has been a turn-off for me. On the other hand, I have met quite a few people within the Green Party who have ideas similar to ones on this site. Many Greens are Georgists, and so am I. Much of what I said about the Libertarian Party could be applied to the Green Party, only replace anarcho-capitalism with socialism. The Libertarian Party calls for too little government to be viable; the Green Party currently calls for too much. If the Green Party is to do more than elect George Bush as president, then it needs to move closer to the mainstream. 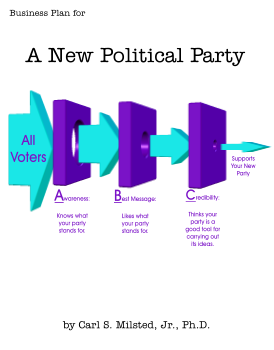 As far as I can tell, the other third parties are either too small or too much like extreme wings of the major parties to be worth bothering with. Feel free to disagree. In my opinion, if none of the four parties covered so far meets the bill, it is time to start a new party, which is the subject of the next section.